Want to send me on a frustrating errand? Have me go shopping for a modest dress for my 14-year-old daughter. While we occasionally have success at Dress Barn or JCPenney, it’s often difficult to find a dress that fits well in the top and is long enough at the bottom. A few weeks ago, I read about eShakti on Olivia’s blog, Fresh Modesty, and she highlighted some really cute styles from their website. What immediately drew my attention was that you can customize many of the dresses according to your preference. When ordering standard sizes, you can modify the neckline (on some styles), type of sleeve, and the length of the dress. Alternately, you can put in your exact measurements for a totally customized dress. I bookmarked a few that I thought my daughter would like, then called her in to look at them. One of her favorites was this Faux Leather Trim Poplin Dress. 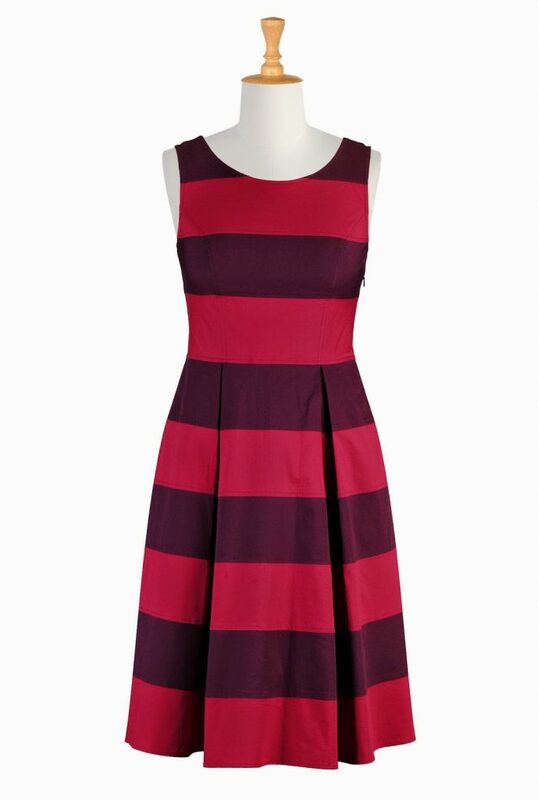 However, we ended up ordering this Banded Stripe Poplin Dress. I ordered her normal dress size, added cap sleeves, and chose below-the-knee length. Some of their dresses are a little pricey, but I’ve been watching the site and they seem to have sales frequently. 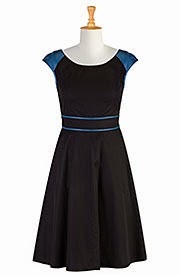 And I got a great deal on this dress, because I signed up for their e-mails as a new customer and got a gift code for $35! I’m already planning to shop at eShakti when we look for spring (and Easter) dresses! Have you ever shopped at eShakti? Where do you like to shop for dresses for yourself or your girls? I don't know what I would do for dresses for my girls if my mother didn't make them, especially for Sarah Beth since she's so tall and thin. It's so hard to find nice, modest clothes these days. This site sounds amazing! I really like how you can customize clothes. How nice! OOh…great site! Thanks for the link. Sophie is in size 8 and it's way tough to find appropriate and modest dresses for her.